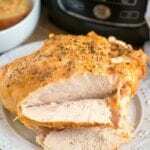 Pressure cooker turkey breast that’s tender inside and crispy on the outside! 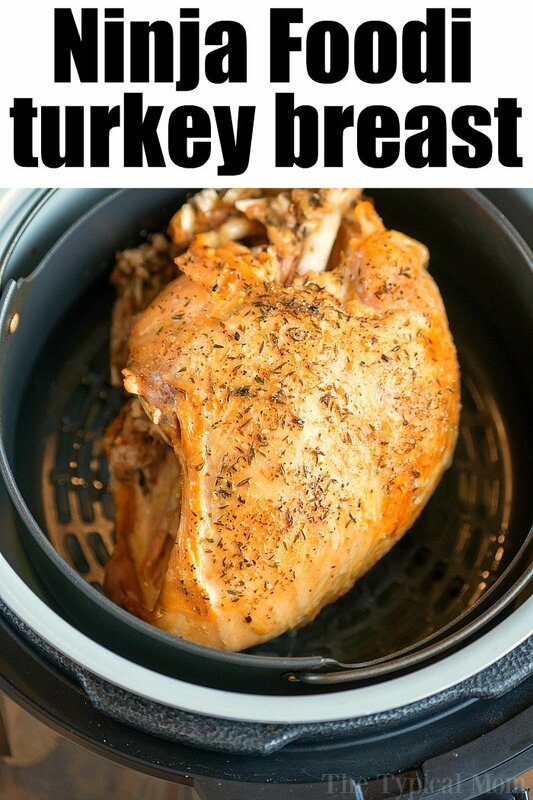 Learn how to cook a bone in turkey breast in your Crock Pot Express, Ninja Foodi or Instant Pot. Do you have this nifty pressure cooker and air fryer machine?? I’m a bit obsessed with it and have created a ton of new Ninja Foodi recipes lately with it. If you’re looking for other great recipes we’ve got ’em! 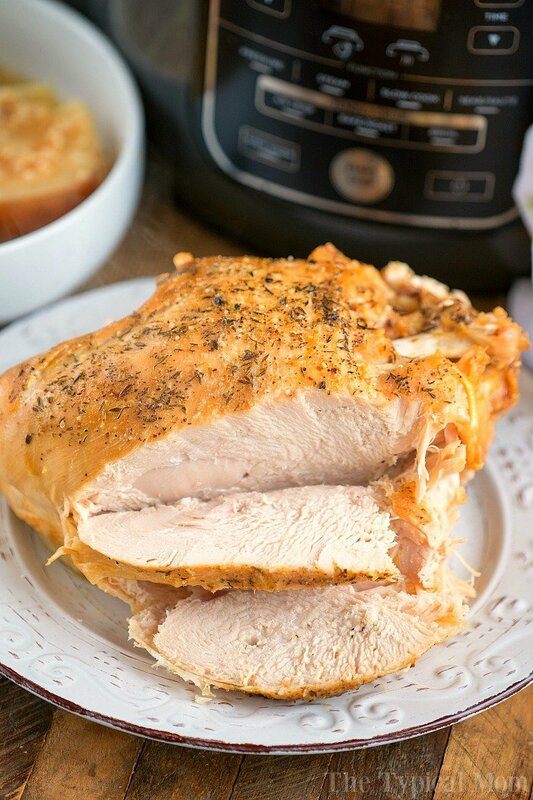 We made a pressure cooker turkey last year but now it was time to share how to make a pressure cooker turkey breast! Yes there are lots of ways to make a turkey. If you have a smaller family though, cooking just a turkey breast can be the perfect size. I have also made a sheet pan turkey using a smaller bird that cooked in about 60 minutes too! I cooked this in our oven and is the only way I’d cook an entire turkey from now on. If you’ve never purchased a turkey breast before they will either be with the whole turkeys during the holidays, or in the freezer section. I made this in March so it was previously frozen and took about a day and a half to thaw out. Keep that in mind when you’re preparing food for the holidays. I wouldn’t recommend cooking from frozen, defrost it first. 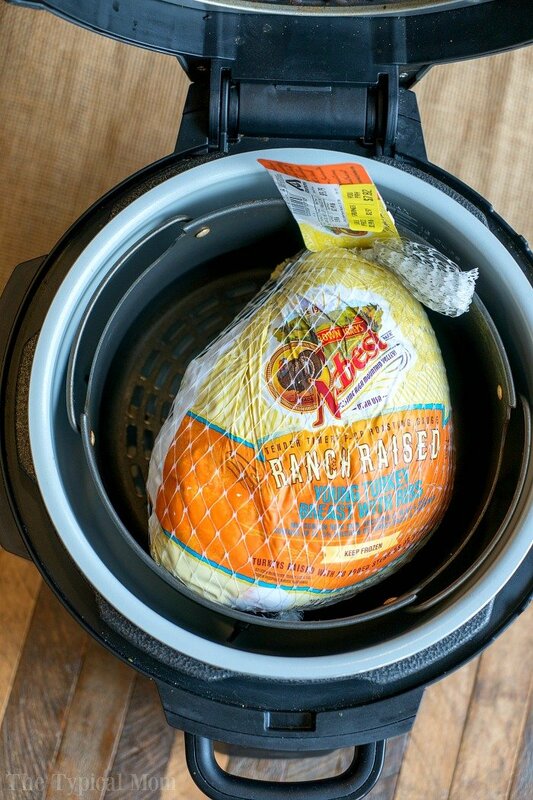 Why I love pressure cooking a turkey. There is no need to baste it. Just throw it sprinkled with salt and pepper, on high pressure, and walk away. How do you cook a pressure cooker turkey breast? Add a sliced onion and minced garlic to the bottom of your pot. Slice 2 large potatoes in half and place the cut side down. These will act as your trivets. Place the breast side facing up with the ribs on top of the potatoes. We used a 4 pound turkey breast and it fit nicely. Season the top as desired. Pour chicken broth into the pot. Close pressure cooker lid and set to 30 minutes on high. This timing was perfect for this size breast. Then crisp the outside to your liking, slice and serve! Our piece had the little red timer in it which was nice, and right on time when I opened the lid I watched it pop up! Now DON’T throw away the drippings underneath because you can make pressure cooker gravy with that! We also have a list of the best Thanksgiving sides if you’re making it for a holiday get together. Electric pressure cookers are so versatile that you can even make homemade cranberry sauce in it! I’ll never make it on the stovetop again. Let me tell you one of the best, surprising, parts of this meal. The potatoes are to die for! Soaking up all the juices from the broth and drippings from the turkey in the cooking process they just fall apart with goodness. Tender and FULL of flavor these potato “trivets” will be fought over believe me! You do want to make sure the potatoes are rather large though. You are going to cut them in half so they’ll be even smaller and in for about 40 minutes total they will get quite soft. Even as large as I chose they were falling apart as you can see. So, choose BIG. Either russet or red potatoes work. I just prefer red myself. Side dishes to pair with your Ninja Foodi turkey breast (or any other brand of pressure cooker you’re using). 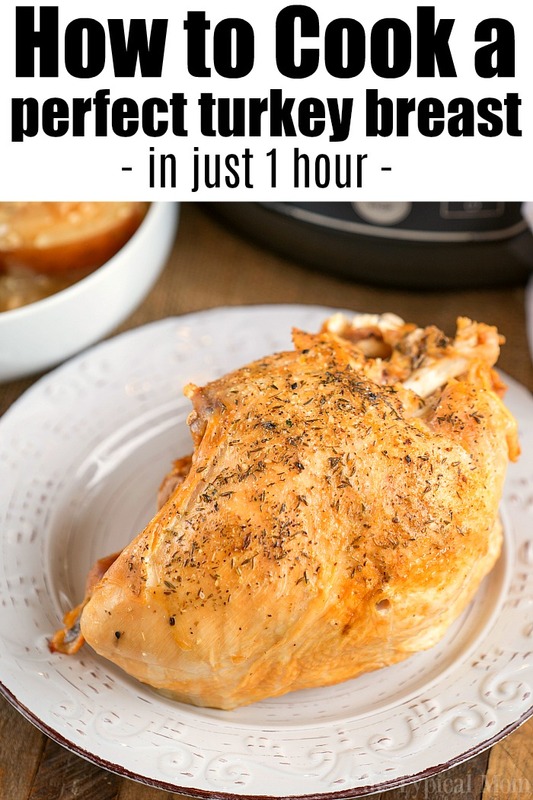 Pressure cooker turkey breast that's tender inside and crispy on the outside! 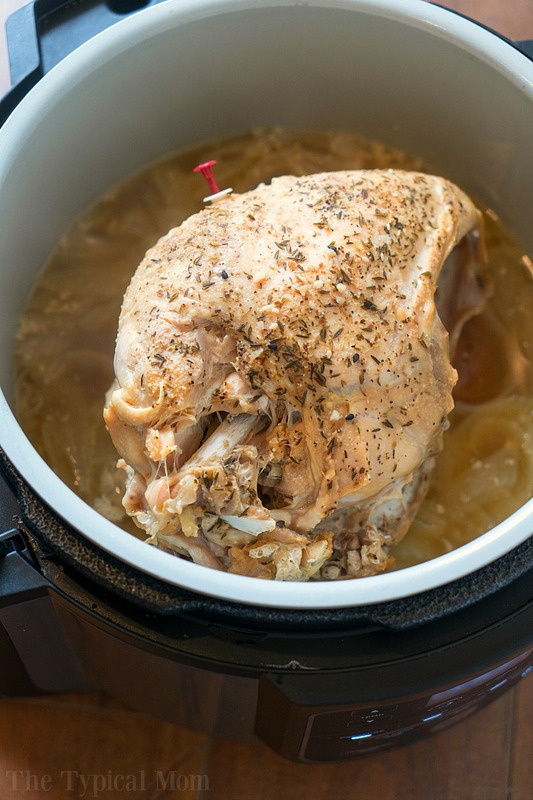 Learn how to cook a bone in turkey breast in your Crock Pot Express, Ninja Foodi or Instant Pot. Slice your onions and cut your potatoes in half. 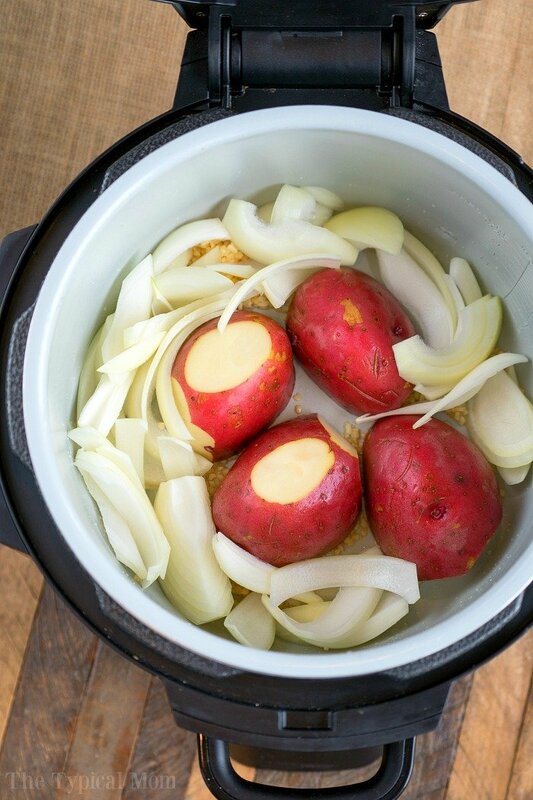 Place potatoes with the cut side down into your pressure cooker in the middle. Push them together so they form a "trivet" for your turkey breast. Sprinkle onions around the potatoes. Rinse your turkey breast off and set it on top of your potatoes. Sprinkle with thyme, oregano, garlic powder, onion powder, salt and pepper. 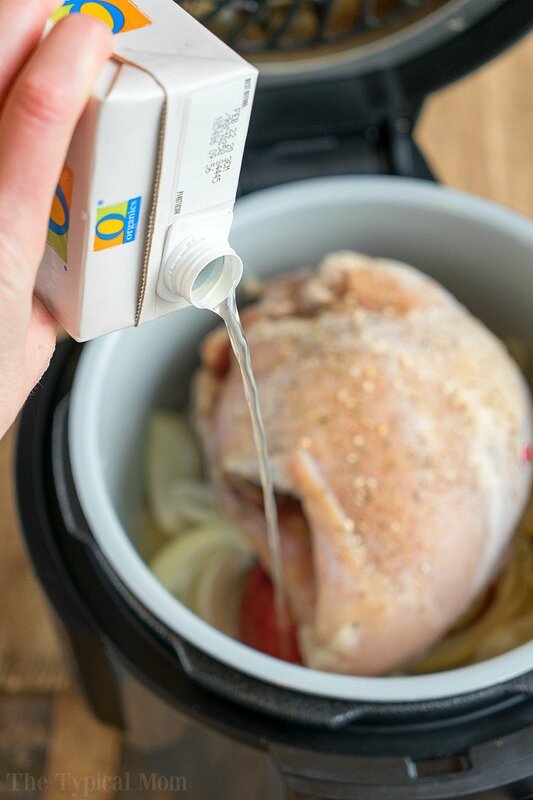 Pour chicken broth around outside of turkey. Close pressure cooker lid, shut steam valve. Turn to pressure, high, for 30 minutes. Then allow pot to naturally release steam for 15 minutes. Let out rest of pressure and lift lid carefully. If you want to brown the top of your turkey breast then remove it from the pot and set aside. 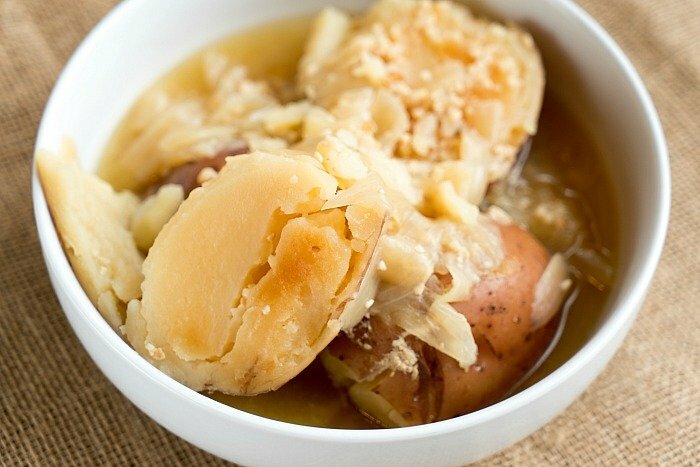 Put potatoes and onions in a bowl to serve, pour broth into a bowl to make gravy. Drizzle with your olive oil, sprinkle on garlic salt and close air fryer lid. Press air crisp, at 390 degrees for 8-10 minutes (10 was the perfect crispness for us). Serve!! If you do not have this then put your turkey breast in an oven safe dish and put under your broiler for about 5 minutes or until the top is as brown as you'd like it. Link to directions for making turkey gravy with the drippings in this post as well. Thanks this makes turkey dinner an option any day! Flavorful and juicy on the inside, and super crispy on the outside thanks for the air fryer. Will make again soon!